For a Procter & Gamble northeast manufacturing plant, Cole Chemical plays the role of Supply Chain Captain. We also provide vendor managed inventory and warehousing. One of our first actions for this client was to locate additional warehousing space for a growing operation. Cole Chemical located a qualified warehouse facility within minutes of the plant site. Procter & Gamble could expand their manufacturing operations into a global plant using their original warehouse space. The relationship has benefited both Cole and P&G. P&G can still negotiate directly with suppliers to obtain the lowest product cost. While Cole manages all orders, logistics, inventory, quality control, billing, and payment. P&G reports increased profits from the operation and reduced product quality problems from packaging and documentation issues. For 30 years, Invista has had Cole Chemical warehouse full truckload shipments of a neutralizer, a product only used for emergencies in case of spills. Cole Chemical then ships in smaller lots as needed. The customer saves money, who doesn’t have the warehouse space to store truckloads while assuring them access to product when needed. 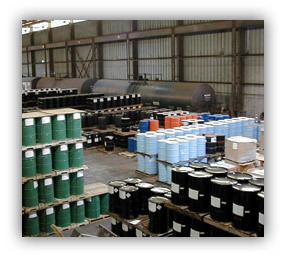 Cole Chemical can help you locate and lease warehouses. We use ISO processes to qualify, audit and monitor warehouses, blending facilities and storage locations. © Cole Chemical & Distributing, Inc.